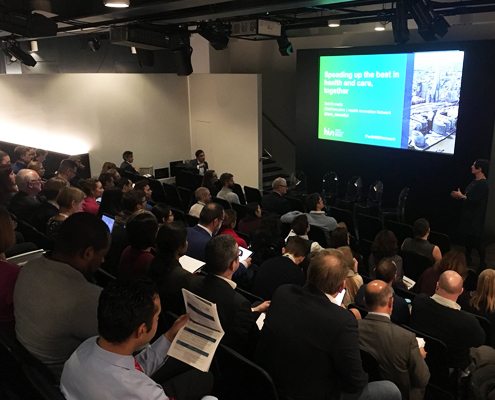 NIHR CYP MedTech were happy to be part of the inaugural Guy’s and St Thomas’ Hospital (GSTT) Innovation Conference held in the London Science Gallery. This conference enabled clinicians, academia, innovators, industry and healthcare managers to discuss the future of innovation at GSTT and how this will impact significantly on improving healthcare. The conference was broken down into four main sessions, the first of which discussed the innovation landscape in the NHS, academia, the digital environment, the city and internationally. In the next session, representatives from the Health Innovation Network, the Health Foundry and the GSTT charity gave their perspectives on key opportunities for innovation and how they can support this. Prof Seb Ourselin also gave an interesting talk on the development of a Medtech Hub at GSTT that will support the clinical and commercial translation of digital health technologies. The afternoon included inspiring presentations on lessons learnt and arising opportunities from experienced innovators, Dr David Cox and Dr Richard Illes. The conference enabled NIHR CYP MedTech to understand the current innovation landscape, as well as the clinical needs and opportunities for new technology innovations and how these can be implemented efficiently to improve paediatric healthcare delivery.